Want your Valentine’s Day dinner to be special? Try this Roast Duck with Mocha Raspberry Sauce recipe from Chupon’s kitchen! Preheat oven on broiler setting. Use a fork to score the duck breasts through the skin and fat but not all the way through to the meat. Heat a large heavy skillet on medium high. Fry the duck breasts skin side down, until the skin browns and fat runs out, about 10 minutes. Remove the breasts from the pan, and pour off most of the fat. Return breasts to pan, and fry skin side up for another 10 minutes. Remove breasts from pan, and allow to rest on a baking sheet. Mix the sea salt, cinnamon and Demerara sugar together and sprinkle over the skin of the duck breasts. Pour most of the fat out of the frying pan. Mix together the red wine, cassis, and cornstarch in a small bowl. Pour into the pan, and simmer for 3 minutes, stirring constantly, until the sauce is thickened. Add raspberries, Chupon Mocha Chocolate and simmer for another minute until heated through. Broil the duck breasts skin side up, until the sugar begins to caramelize, about 1 minute. Slice the duck breasts thinly, pour a little sauce over the top, and serve warm. 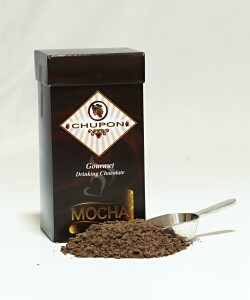 Need to get some Chupon Mocha Chocolate? Visit our store page.